Hello all. Newly registered. My name's Brandon Steger, I'm often referred to as Dean's buddy. Me and him grew up together. I live near Trenton, SC. Used to wheel a Toyota then got out of it when Tellico got shut down. I've now got the wheelin bug again. I just bought the first Jeep I've ever owned, an 04 LJ. 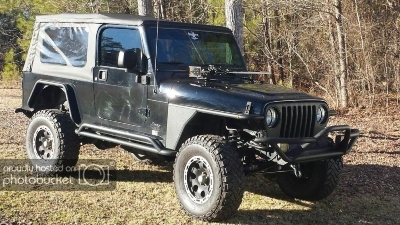 It has a Rubicon express 4.5in short arm kit, Smitybuilt fenders, sliders, and bumpers. Drivetrain is stock: Auto, D30/44, 3.73 gears. Within the next month i hope to put some 4.88´s and an Aussie in the rear. Might lock the front too but I world love to put that money towards a frt D44. Might also replace the springs with some 3.5's. Anyway, I'm planning on the OSCAR trip to Harlan. Also going to Adventure Offroad in march. Tellico some time, maybe June. And Colorado this summer. I know a few of you guys. Look forward to meeting yall in Harlan. Im glad you got something else to wheel. Im looking forward hitting some trails with you again.